Experiencing a stressful situation at work? Carrying concern around over a family issue for an extended period of time? It’s no wonder that your shoulders feel tense, your neck aches, and your lower back always seems to be sore. 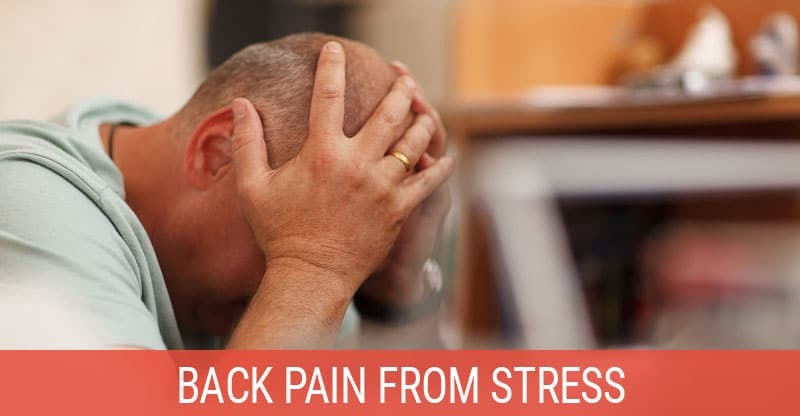 Stress has a way of manifesting itself most literally as back and neck pain, which in an unfortunate cycle, can lead to more stress, and so on and so forth. Understanding how stress leads to back pain plays a crucial role in overcoming it. Stress and anxiety have a knack for leading to bad behaviors which can cause and exacerbate back pain. These may include eating junk food, not exercising, and slouching and slumping on the couch. Indulging cravings for processed foods, sugary drinks, alcohol, and fried food may seem like a quick fix to your emotionally stressful day. Oftentimes, these foods trigger pleasure centers in the brain and you end up eating much more than you planned on. Not only does an unhealthy eating habit which stems from chronic stress lead to weight gain, but it can also affect mental clarity and overall mood. Weight gain, especially in the mid-section, can alter your center of gravity, causing you to even imperceptibly alter your gait and the way you sit. As you lean forward with your stride instead of straight up and aligned, your spine and adjacent muscles and tendons have to work harder to stabilize your back. 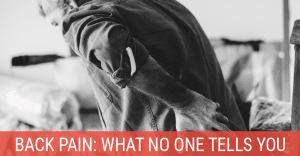 The pulling and tugging of these important connective tissues overtime leads to inflammation, strain, and pain. What to do: Avoid unhealthy eating by stocking up on sweet and savory healthy snacks at work and at home – nuts, dried fruit, whole grain chips, guacamole, hummus, dark chocolate, and fresh fruits and veggies are a good place to start. Plan a menu out for lunches and dinners for the week and stick to it; avoid eating out when possible. And be mindful of your stress triggers and what some of the junk foods are which you tend to go for – get them out of the house and keep them out of the house. 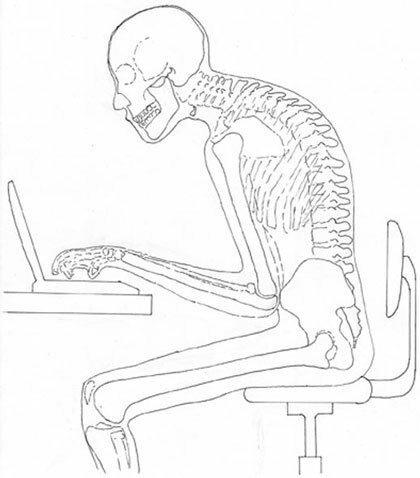 In addition to unhealthy body positions which accompany weight gain, a rounding of the shoulders, a hunching of the spine, and a craning of the neck can also come from simply practicing bad posture throughout the day. While a figurative concept, stress can literally feel like a weight sitting on your shoulders. Combine that with a day spent working on a computer, watching TV, and staring down at your phone, and you have a recipe for Forward Head Syndrome. 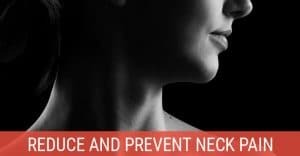 When your neck and head inch forward past your shoulders, the force with which gravity is pulling you down towards the earth is amplified, applying up to 30 additional pounds of pressure on your neck and connected back muscles – youch! What to do: Practice sitting up straight as much as possible and never sit with your legs crossed as this can lead to pelvic imbalance and extra strain on the spine. Never sit for more than 30 minutes at a time without getting up to stretch and walk around, and practice deep breathing which naturally encourages you to lengthen and extend the spine and open the chest. One of the best things you can do to naturally remedy back pain is to exercise and get muscles moving, blood flow circulating, and bone density building. Stress often fosters feelings of fatigue, lacklusterness, and general depressive moods. What does that mean? It’s harder and harder to pull yourself out of bed and out of the house to exercise. The less you move, stretch, and flex your back muscles the tighter and stiffer they become, resulting in aches, inflammation, soreness, and pain. Lack of exercise and anxiety associated with stress can also cause an increase in blood pressure. A chart with blood pressure range for men by age (and women) reveals that as people age, if they exercise less, their blood pressure tends to rise – this can lead to health problems like heart disease and stroke down the line. What to do: Think about embracing activities and exercises which prioritize stress-relief at their very foundation. Mindfulness-cultivating practices like yoga and tai chi help you exercise and stretch muscles as well as de-stress with deep breathing and meditative components. Getting outdoors has been shown to boost mood and alleviate stress as well, so incorporate more hiking, outdoor walks, even golfing into your exercise routine. Emotional stress can loom like a dark stormcloud in your brain, making it hard to go about day to day activities as well as to get a good night’s sleep. The biggest problem here is that it is during sleep at night precisely in which the body goes about tackling stress and lowering cortisol levels. Lack of sleep in addition to tossing and turning, sleeping in odd positions, and not getting the proper spine support you need during times of rest can result in mild to severe back pain in the morning. What to do: Give yourself the best chance of falling asleep at night by avoiding blue light (like from electronic devices) up to two hours before bedtime. Make sure you are sleeping on a mattress that supports the natural curve of your spine, and use sleep apps which are engineered to gently wake you in the morning at the best time based on your own circadian sleep cycle. Stress is almost inevitable, but your response to it doesn’t have to be. Before heading to the bakery and giving up a trip to the gym to stay in bed on Facebook all day, think about what your body and mind really need to wash themselves of stress. Exercise, healthy food, good sleep . . . all of these seemingly simple things can add up to a powerful and positive difference when it comes to back pain. 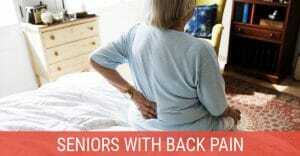 (Editor at Back Pained) – Adam is a former longtime back pain sufferer who is now pain-free. 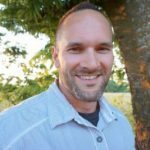 He has created this site to help others get back pain relief at home as an alternative to expensive specialist appointments or physical therapy that may or may not work. A research junkie, he's spent considerable time determining which of the countless back pain products actually work and which ones are a waste of money. He now enjoys spending time on the basketball court re-learning that jump shot from when he last played in high school. Quell Pain Relief Review – Is it Worth the Cost? © 2019 BackPained.com. All rights reserved.